: Rose, types, reproduction, growing, care, examples of landscape design, photo and video. Musk rose is in bloom. Beautiful and unique species and varieties of this plant so much, what about each you can write the whole research. The ancestral home of wild species is in Japan and Northern China. Rose growing in the far East, on the coast and meadows. The shrub can reach up to 2,5 meters in height. Flowers – large, fragrant, solitary or in inflorescences, simple or double. Flowering lasts all summer, leaves – wrinkled, on the underside is grey – green pubescence. In hybrid forms can be glossy, shiny leaves. On the Bush there are numerous spikes, deflexed. The species forms large, fleshy fruits are orange-red. Light-loving plants, for landing the preferred flat areas or slopes, protected from strong winds. The species requires fertile and moist soil, responds well to mulching and application of organic and mineral fertilizers. Spring planting is preferable, the plants are placed at a distance of five feet from each other. Perhaps planting hedges, in this case, the distance between the bushes reduce by half. Before planting in the soil are humus or peat, superphosphate, potassium salt. Depth of seal – 10 – 15 cm. The aboveground part is shortened, leaving no more than a third of the length of shoots. Blooming rose rugosa, the sort of “Hansa”. The first two years after planting do not fertilize, then make urea based 15 – 20 g per square meter of soil. Every three to four years, in the autumn, the plants are fertilized with potassium salt and superphosphate. 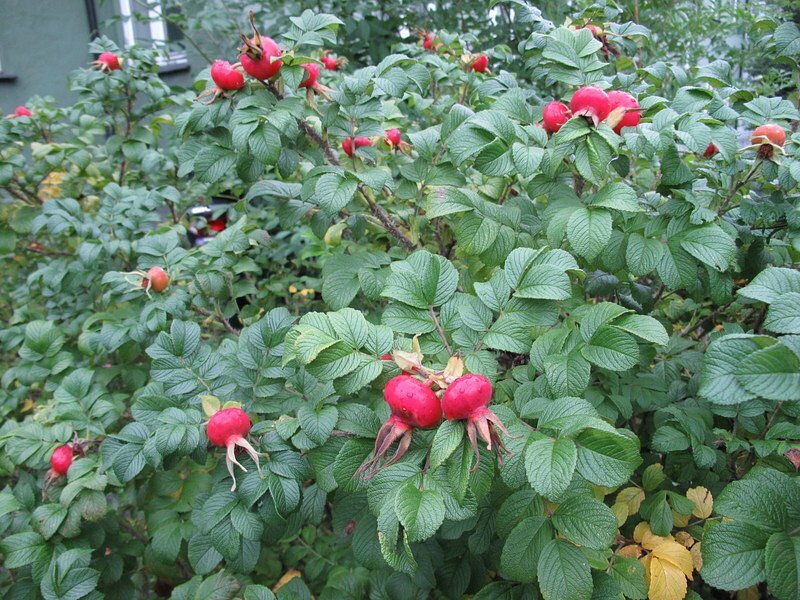 Regular pruning will help the proper formation of a rose rugosa, removed by dry and weak shoots. The number of branches normalized: after the Bush age of six years it should not be more 15 – 20. Decorative fence from roses rugosa will protect the area from intruders and prying eyes. In September, the foliage of some varieties of roses acquires a reddish colour, and in itself becomes a good decoration of the garden. 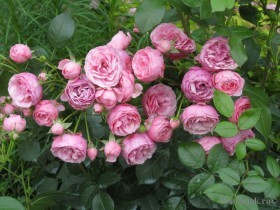 Old varieties of tea roses were beautiful, not picky about weather conditions and have often been struck with disease. Breeders managed to bring hybrid tea samples, more cold-resistant and with better immunity. 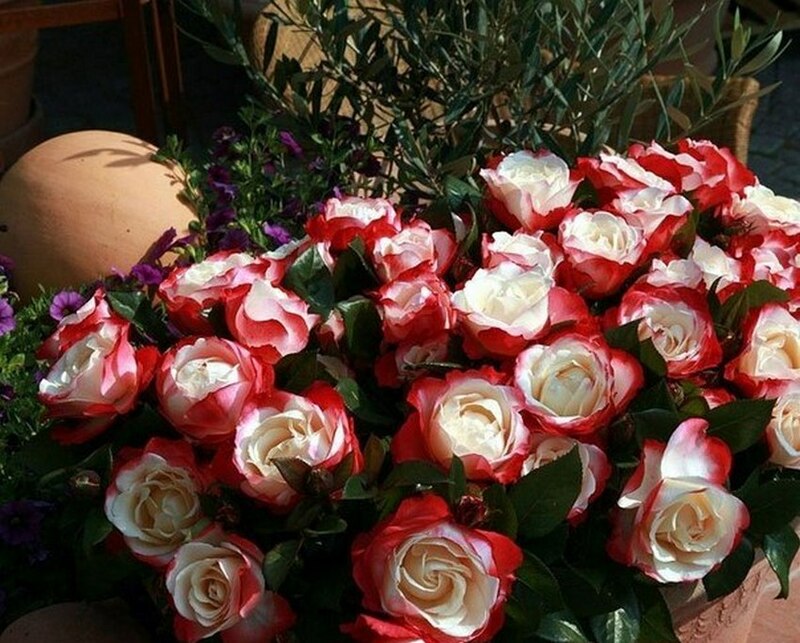 This group of roses is the most popular, the number of color variations, shape and flavor unquantifiable. 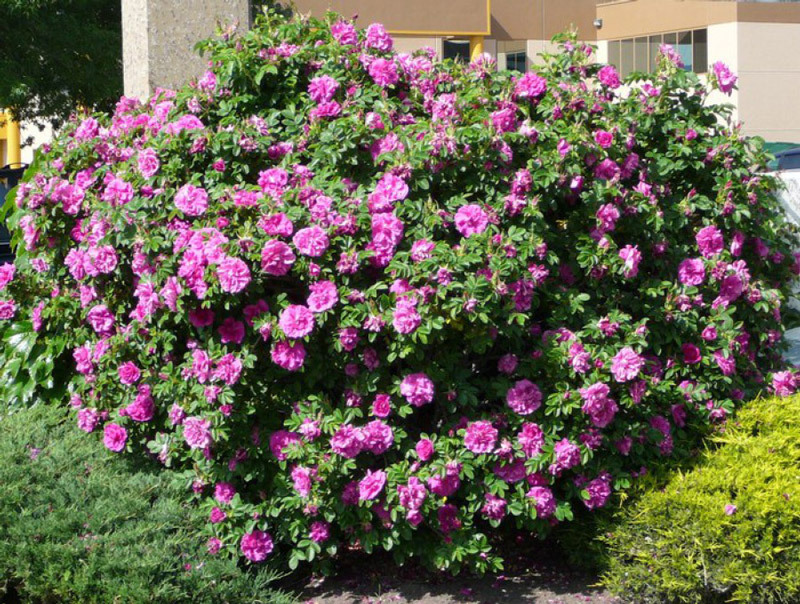 The bushes a small or medium size, flowers – large, culture can be Stam, it is perfect for small gardens and land plots of size. Hybrid tea rose, the sort of “Montezuma”. Varieties differ in the height of bushes, form, the number of petals in the flower, shade, aroma. In the middle zone of the plants begin to bloom in mid-June, and decorate the garden until late autumn. The form can be damaged by severe frosts, but under the shelter it winters well. Spring hybrid tea roses are planted so, to the site of inoculation was two or three centimeters below ground surface. Triple cropping, spring – main. 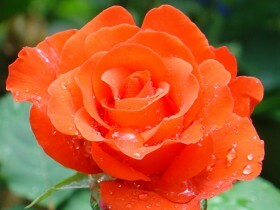 Care, watering, breeding and other agricultural practices – such as, like most roses other types. Beautiful plant susceptible to fungal diseases, such as black leaf spot, powdery mildew, rust. In the first case the bushes are sprayed with a soap-alcohol solution. Powdery mildew appears during the rainy season, roses are better planted in a ventilated place, the affected leaves are destroyed. Rust may appear in the case, if the plant is located near juniper, should not be planted these crops together. The bushes, cases of Botrytis, sprayed a decoction of horsetail. Common pests of roses are aphids and scale insects, rozany borer and leaf rollers, Rosanne cicadas and thrips. In all cases, the affected parts of the plant need to quickly remove and destroy, save the remaining bushes will help insecticides. Nematodes can destroy the bushes completely, in their place for a few years you can plant calendula, which will help bring these small worms from the soil. A story of this kind is associated with the name of the breeder from Denmark of Poulsen, which crossed hybrid tea form with polyanthus. 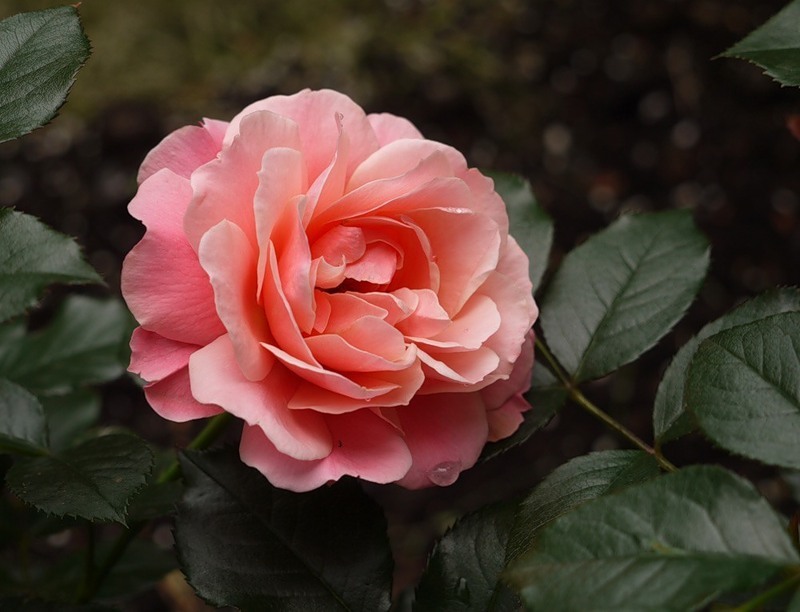 New varieties have preserved the dignity of the parents, rose floribunda – floriferous. The group consists of a variety of continuous flowering, the abundance of colors and aromatic nuances, the hardiness and simplicity won the hearts of gardeners: kind of very popular. Rose floribunda, the sort of “Botticelli”. Planted the bushes in the flower arrays, along the paths and tracks, in borders, create a low hedge. Techniques of heading and cutting in this type are the same, as tea roses. Bushes planted in the spring, the vaccination site should be two to three inches below the soil surface. Pruning is carried out three times per season: in the spring, in summer and autumn, the primary. Remove the top part of the shoots, developed shoots pruned to 10-15 cm. Miniature roses in garden design play a special role, they combine classic shapes hybrid tea roses and abundant flowering floribunda roses. Small bushes can be planted anywhere – on the hill, in the basket, in containers and among the rocks, in the curb and the rose garden in the foreground. Mini roses were imported into the European part of the continent from China, it happened in 1810 year. But the real history of the plant began after a hundred years, when in one of the mountain villages of Switzerland, a local resident found a Bush with tiny buds and brought him to his home. The resident called Dr. Rolett, and propagated the rose got it's name. Thanks to the efforts of breeders, culture found an amazing variety of forms. 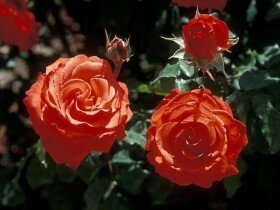 Own-rooted roses do not give the "wild" seedlings and maintain the grade, the main method of reproduction – cuttings. In the greenhouse this procedure can be carried out at the end of March or in early September, outdoors – late may-July. For obtaining planting material using the middle part of annual shoots of healthy. The length of the segment – 10-12 cm, it should be at least three buds. The sheet should be halved, the lower section is located above the kidney, top – above the kidneys one centimeter. Knife cuts should be disinfected. In cuttings the drainage stack of gravel or sand, expanded clay or broken bricks, poured earth, layer 10 cm, top pure river sand. The cuttings are dipped in the nutrient solution, purchased in a specialty store, then densely planted at a distance of two to three centimeters. Put on top of the arc and delay the film. Roots are formed through 40 – 45 days. In the first year plants, planted in the ground, do not grow very abundantly, in the second year they appear in all their miniature glory. 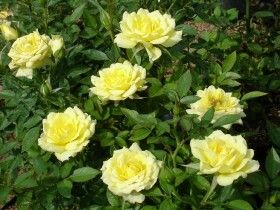 Order miniature roses bloomed well, you need to choose a Sunny plot, protected from the North winds. The best soil – loam with weak acidity. On dry sandy soil this species grows poorly. In the planting hole making two or three buckets of compost, mixed with the same amount of sand, lime, bone meal or superphosphate, wood ash. Drainage is required, if in the spring the area is filled with water. During the summer, the roses fed, this should be done three to four times per season. In the first half of the warm season make nitrogen fertilizers, secondly – phosphorus-potassium. Loosen the soil. 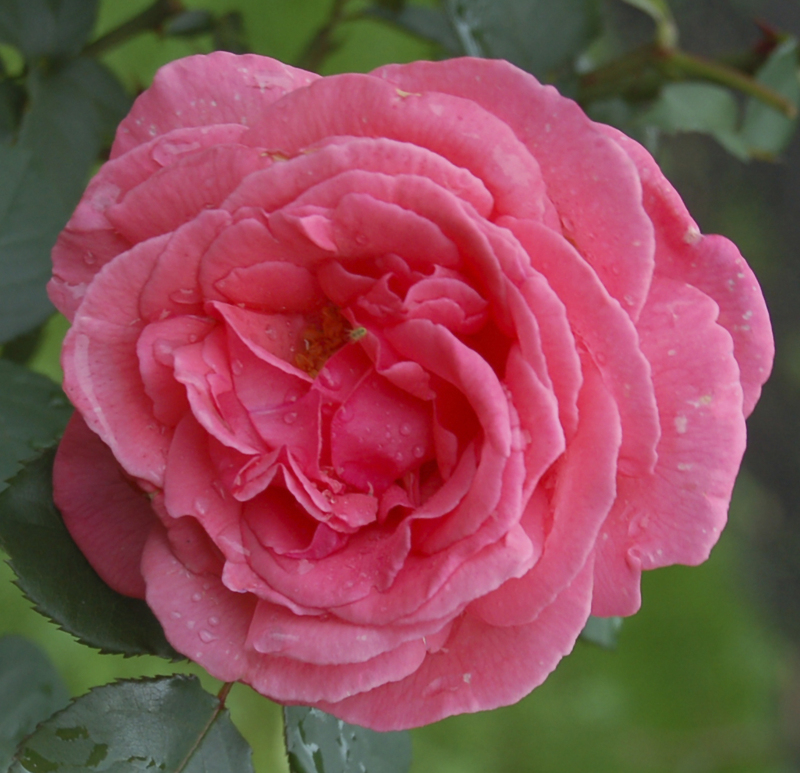 Morning and evening mini rose is useful to spray from a hose with spray. In the middle zone, the plant needs a winter shelter, for this purpose, suitable fir spruce branches, then set the wire frame, fit the insulation and plastic film. 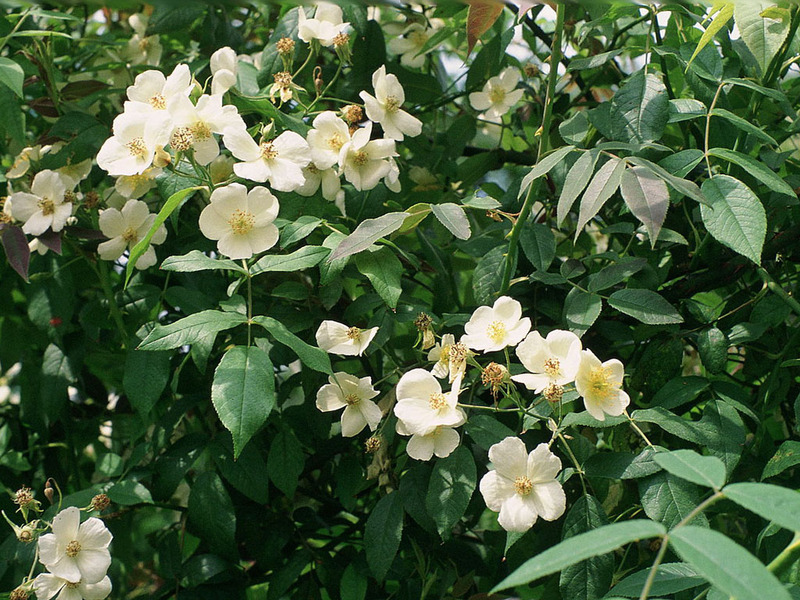 In the garden miniature roses are interesting to look at the rock garden or small, raised beds. You can plant several flowers of different shades. Baby amazed aphids and spider mites, powdery mildew, rust. In the case of small lesions of powdery mildew, the plants sprinkled with powder of colloidal sulfur, if the defeat of the strong – bushes sprayed with a solution of soap with copper sulphate based: 20 g sulfate and 200 g of soap in a bucket of water. To eliminate rust rose is treated with liquid Bordeaux. Affected branches are cut and burned. Wild look to this rose has long been known, it grows in the Caucasus and the Himalayas. Homeland is southern China and India, where this evergreen shrub grows happy and pleasant aroma all year round. The species attracts the attention of gardeners for the abundance of flowering, the duration of flowering, decorative, unique flavor. Flower color – from dark red to light pink. 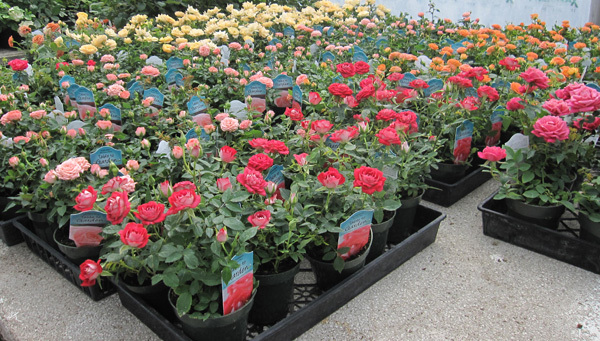 When purchasing own-rooted roses with a closed system, they are best planted in the spring. The first fertilizing is carried out in the spring, after removing the cover, the ammonium nitrate is dissolved in ode is based: tablespoon of the preparation in a bucket of water. If the weather is rainy, through 10 – 12 days fertilizers are applied repeatedly. Two weeks later, the procedure produces for the third time, usually this coincides with the period of budding. After fertilizing the plant can be watered with a solution of mullein or albumin, chicken manure, or fermented infusion of the herb. On the third and subsequent years after planting, one or two old escape removed, it stimulates the growth of new, basal shoots and retains the shape of the Bush. In winter the plants Spud sand to a height of 30 cm, bends to the ground. The foliage is removed, branches treated with a solution of iron sulphate. Musk rose breed vaccinations, cuttings, dividing the Bush. 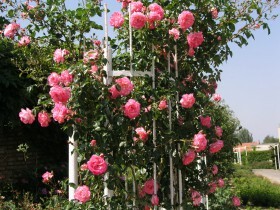 Climbing roses are planted there, where there is support: near the walls and arbors, purpose built vertical structures. When selecting species and varieties of roses consider all the nuances: climate, the location of the site, the condition of the soil. Subject to all of the most important agrotechnical methods of plant will delight for a long time and do not deliver much hassle garden. Klubowa rose floribunda, the sort of “Pomonella”. Mini-rose, a grade of “Angela Rippon”. 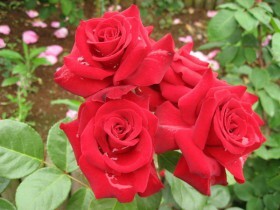 Hybrid tea rose breeding Cordes. Mini-rose, the sort of “Ella”. Rose floribunda, grade “Nicolo Paganini”. 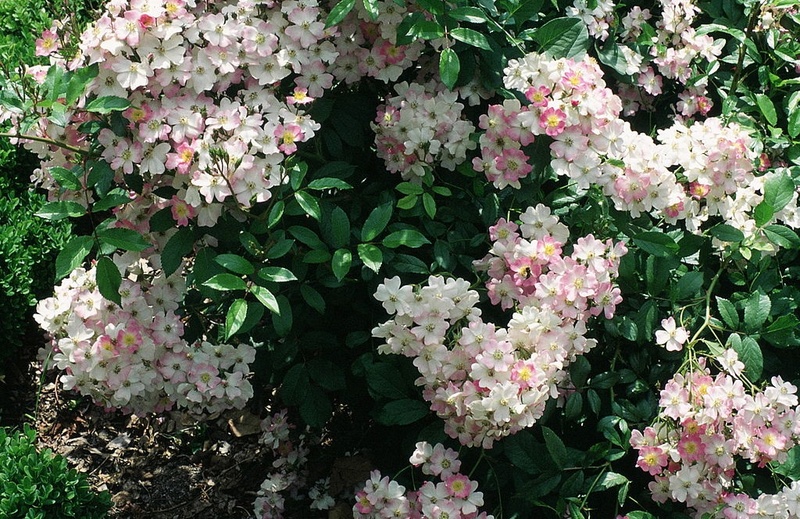 Ornamental shrubs: what to choose? All content on this site SamDizajner.ru written specifically for Simdesigner, copying 1 in 1 strictly prohibited. Reprint, full or partial rewriting of the article “The types and varieties of roses”, possible, only when you specify the full, active link to the source.